After a noticeable interval of time since the quilt frame and Qnique quilting machine were set up, I decided to quit ruminating about whether I was ready to quilt a real quilt (as opposed to practice swatches) and I just loaded one up. The top looked pretty decent, but when I took it off the frame, there was a big long pleat across the back. If the big pucker was near one of the edges, no problem to rip away and redo. But since this is in the middle, I’d have to rip and redo fully half of the whole quilt. Oh, I found several other bloopers and blunders in the quilt top too. This quilt top has been lying around in plain sight, to the point where I was just a bit sick of looking at it. The pattern is Irish Chain, which I dearly love, especially in shades of green and white. I can see myself doing rather many more of these in the future. But this one? It’s going to UFO land for now. I can’t give it to anyone in the shape it’s in. 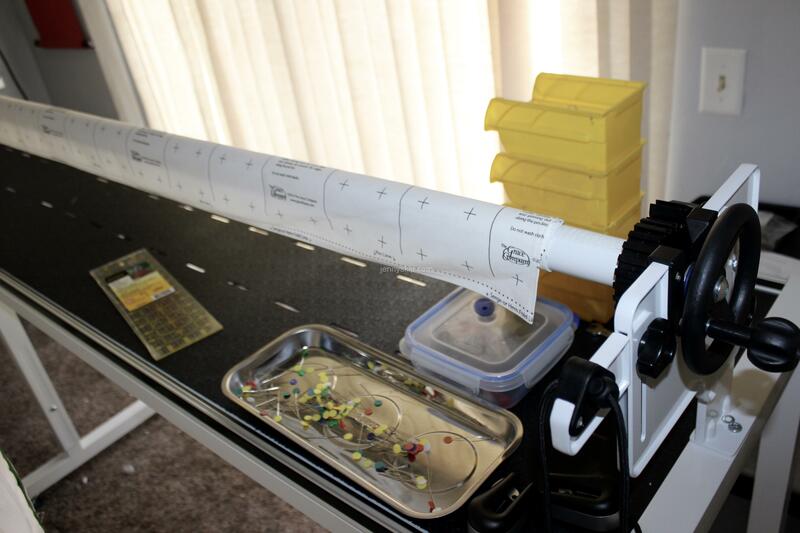 Because of the direction in which the quilt was rolled onto the take-up rail after it was quilted, the rolled quilt became so large in diameter that the ruler base–a flat, hard plastic panel that is attached to the bobbin case under the throat plate of the machine with magnets, bumped into the big roll and got shifted off its magnetic perch. Then the needle went down onto the hard plastic, which had shifted onto the top of the throat plate, and got stuck in the plastic, breaking off a chunk. And I couldn’t get the needle unstuck without trying lots of different tools and strategies, but of course, finally I did. 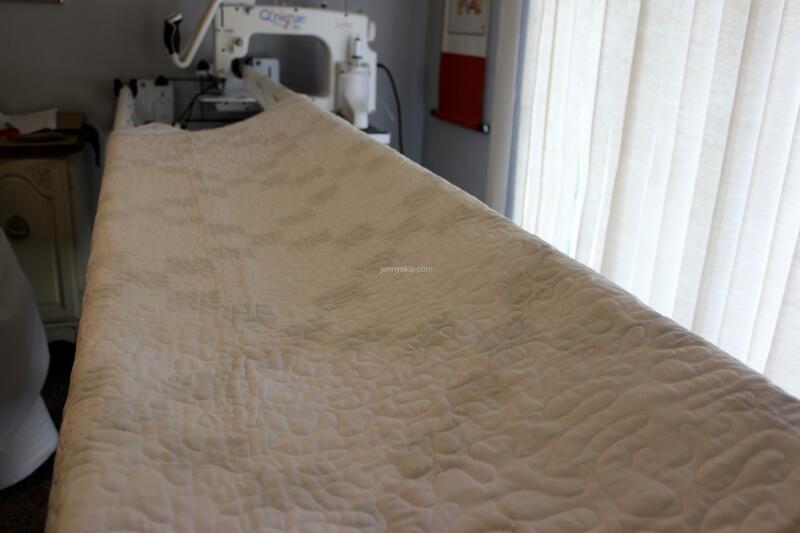 Now, if I turn the take-up roll the other way, the surface to be quilted will remain flat, but rolled over like I did it, an angle is created from the top of the rail to the ruler base on the throat plate. In this angle, the stitching got distorted. 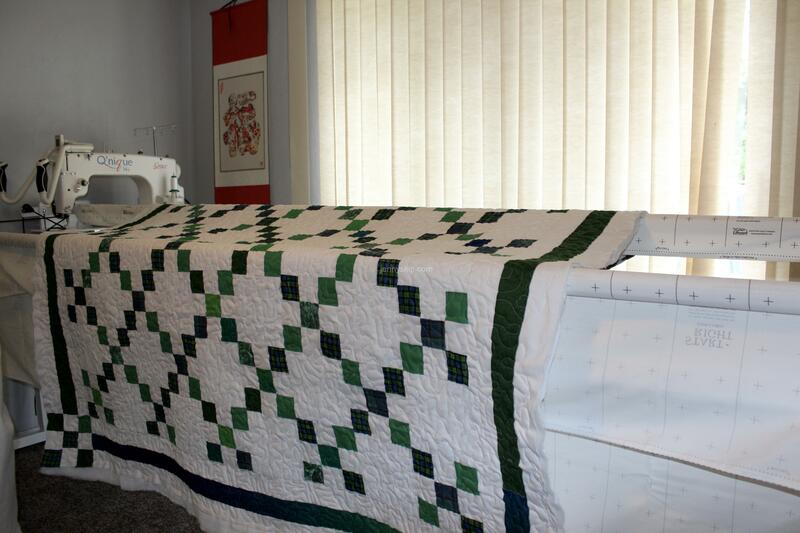 The frame has a fourth rail, upon which a roll of batting can be installed; then you can just roll it upwards, pin it to the take-up rail leader, and then cut it off when you get to the last section of the quilt. I am not sure how the big pucker got there. Possibly because I used a roll of batting that was wrapped double on the roll. As the batting unrolled, one side was pinned to the left edge of the quilt, and the double wrap was unfolded and the other side was pinned to the right edge of the quilt. 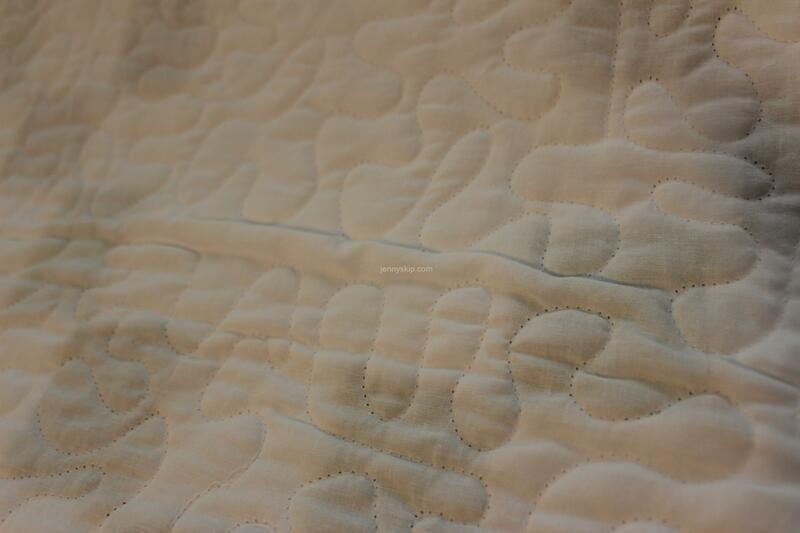 And since the batting was actually way wider than the quilt top, unintentional ripples got rolled up. Unless you climb under the frame and look up, you cannot easily see the underside, which was the territory of the big pucker all the way through the center. Next time, I think I will try to cut the backing and batting to more closely match the dimensions of the quilt top before installing the 3 layers on the frame. Meanwhile, see that window back there? I was getting extremely hot quilting back in that room, even with the ceiling fan and AC on. In our locality, the summer glaring heat and heavy humidity usually abate somewhere around October. If I keep practicing, maybe by then, longarm quilting will become easier and I’ll be happier with the results! Even though I looked at tutorials and pictures of many stitch patterns, I went with the tried and true simple meandering, stippling type stitching. Practicing on swatches is good to do, but I learned lots of lessons by practicing on a real quilt top that I don’t think I would have had drilled into my psyche as deep, with a throw-away swatch!